I am linking up again with Blog Hoppin' for Teacher Week! I have some quick pictures to show how I keep things organized in my room. Sorry in advance for the bad picture quality....they are from my really old phone when I quickly popped into school to grab something this afternoon. 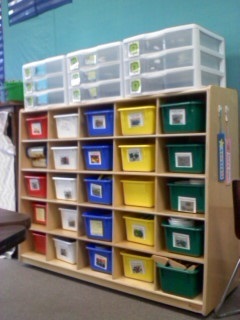 When my classroom is all done & lookin' nice, I will take pictures with my real camera. 1. 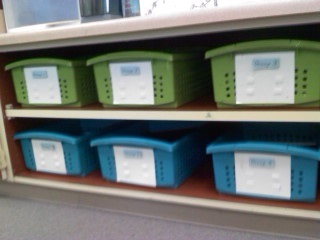 Math manips - I'm sure a lot of teachers have these cubbies, but I just love how they keep things organized! My kiddos can come and grab whatever they need quickly and easily. If I get to it this summer, I am hoping to make some cuter labels for the front. If not, the old ones will do! 3. 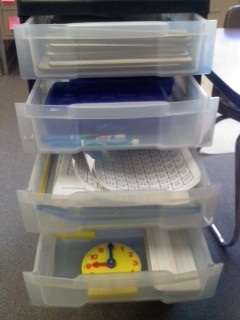 Guided math drawers - I keep these right by my guided math table, and they have saved me so much time! I house our most common math manips in here so that when I'm leading a guided math group, I can easily pull out the tool I need without having to walk over and get it from the math tool cubbies. They help to keep my groups running smoothly! Before you head back over to Blog Hoppin' to get some other fabulous organization tips, make sure you visit Jennifer Drake over at her facebook page: Crayons, Cuties, & Common Core. She is having a FANTASTIC giveaway that I am thrilled to be a part of! Head on over & check it out! Teacher Week '13....Meet the Teacher Monday!